After several years on air, Real Madrid TV needed a complete updating of its systems, in order to be able to broadcast in High Definition, implement advanced systems for the continuity automation and programming planning and integrate third party equipments and software that were previously installed in the channel. The project’s requirements also included being able to develop a complete ‘turn key’ project within a tight deadline. VSN’s solutions have contributed to improve the channel’s quality indicators, its productivity and its workflows’ efficiency, while automating the TV’s continuity for some critical process involving live events, breaking news and last minute changes on the expected programming. This software in charge of managing all the broadcasting servers, the requests to archive and the database including all the material for broadcasting. It allows Real Madrid TV to take last minute decisions about programming in a quick and safe way. 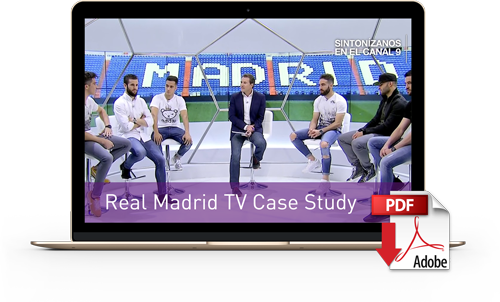 This central system unifies all the media workflows that took place in the channel, and synchronises all the existing databases in Real Madrid TV with the ones of its solutions, easing all the workflows that run on the system.